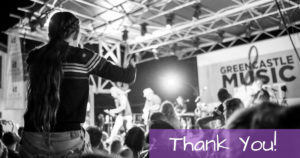 On behalf of the Greencastle Music Fest, I would like to thank everyone who volunteered and helped in to make this year’s event such a huge success. Stage sponsors: York Automotive and DePauw University. VIP table area sponsors: Prime Real Estate and Budweiser. And of course, to Almost Home Restaurant as host of the event and provided food along with Bridges Craft Pizza and Wine Bar. Continued thanks to our table sponsors: Headley Hardware, B & S Miller Plumbing, US Foods, HBG Insurance, Hometown Dental, Daniel Builders, Hendricks Power, Endeavor Communications, Putnam Plastics, Putnam Co. Hospital, RED66 Marketing, and our Corn Hole Sponsor, Dave’s Heating and Cooling, and Coors Light. Eitels flowers and gifts who donated the beautiful flower arrangements for the VIP tables, Jacks Trash, the Inn of DePauw who was the hotel for the event, McAllister Equipment providing all the power needed for the evening, and the support of Main St. Greencastle and the Greater Greencastle Chamber of Commerce. I also would like to thank Mayor Bill Dory and the City Council and County Council for their support in welcoming so many people to our community for an event of this magnitude. The entertainment of Tad Robinson, Ellusion with LD Miller and The Louisville Crashers brought an amazing show to our courthouse square. The Country Harmony singers were wonderful and pleasing to the early crowd. As I watched the crowd on a warm Saturday evening with all the different expressions and joy, I am reminded how much I love Greencastle. Thank you to everyone who made the Greencastle Music Fest a success. This event is made better by all who contributed. I cannot thank you enough for your support.